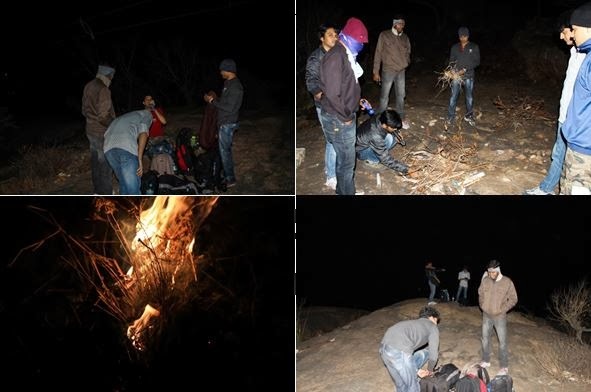 Kabbala Durga Night Trek with 10 member’s team was most memorable one. Most of the trekkers carried trek experience in the night. However it was 1st time ever for me during the night. It was exciting and double adventurous. 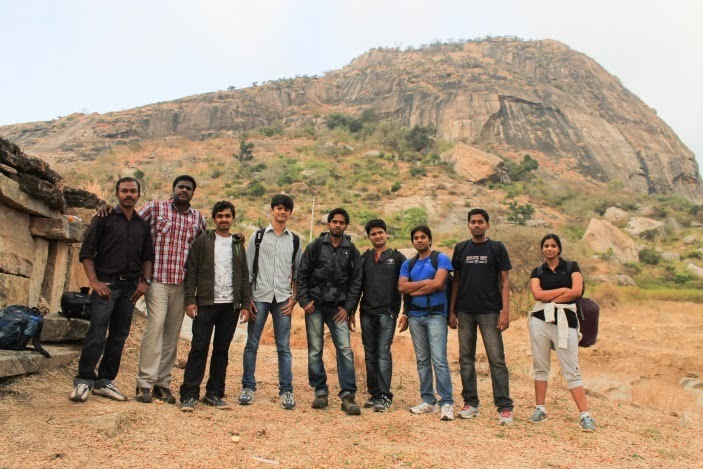 Kabbaladurga is a hill rock approximately 100 kms away from Bangalore near to a small village Sathnuru. The peak is at a height of 3600 ft. approx. 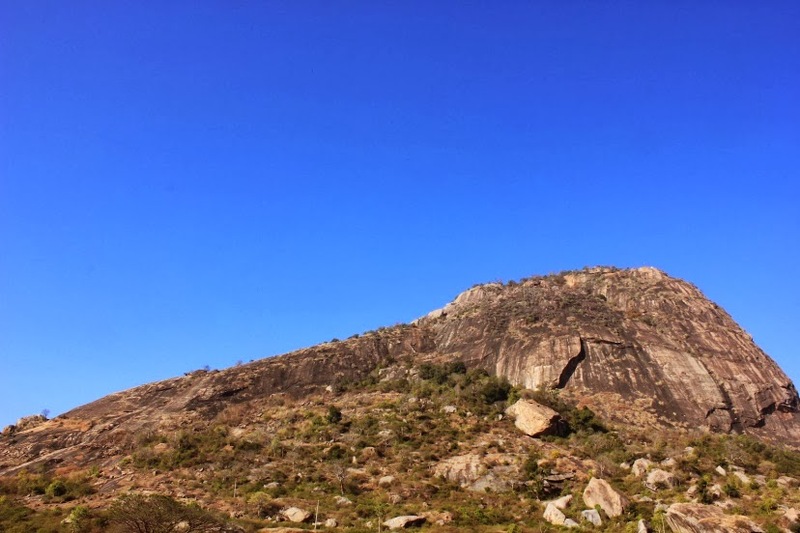 The peak is home to the temple of Goddess Kabbalamma and had derived its name from the temple and the ruins of a fort at the peak. It is green, rocky and serene. Ideal for a day outing. The view from the top is absolutely unique with the scattered lights on ground and sequential lamp posts on nearby hills. We started from Bangalore and reached the nearest village Sathnuru around 0830 PM and after having brief introduction about every trekker we charged ourselves with a few bananas. We started to walk towards the foot of the hill which was 7 KM away from the village. We covered the stretch in an hour’s time and were not tired at all a bit. We kept ourselves busy with every one of us sharing there ghost experiences. 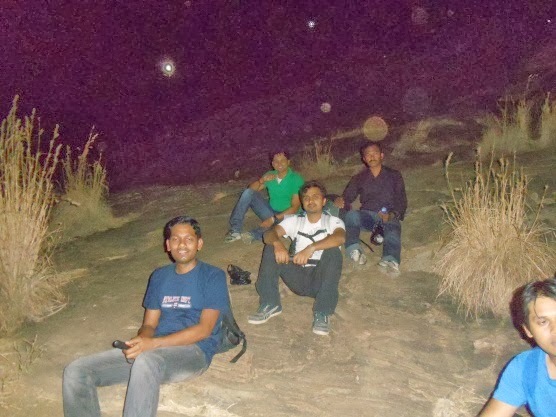 The funniest joke around ghosts was cracked by my friend Mr.Arvind, we relished a lot and all reached foot of the hills at 10 PM. After tightening our shoes we started to trek the hill rock at 10 PM. 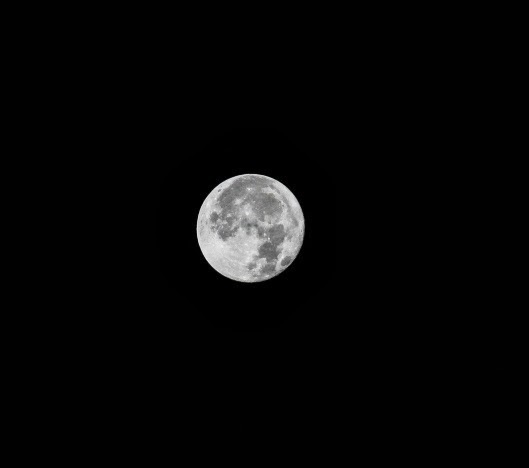 It was a full moon day in the month of Feb 2014 and our torches were not necessary to us. It was absolute silent literally no sound, could hear our lungs pumping air. All the team were supporting each other and would step back for a moment if required by another trekker. We took our 1st short break at 1030 PM before trekking the toughest part of the path. While we all were resting one of our friends who had reached the resting point in the last did not take rest but was grabbing his Cannon to shoot few shots. All were gasping and sweating even during the night hours. Whilst we were resting could feel the tender breeze on our foreheads and it was so relaxing. After charging our lungs we started to move forward on the rock hill which was almost at 60 degree angle. I made all to pass me as I wanted to see the ground from the hill. It was amazing; I was at the edge of the rocks. I grabbed a small stone and rolled it down and heard the sound of rolling stone only for a fraction of second. Possible because the stone was in air in few feet away us. Later moved forward and reached the peak of the hill at around 1145 PM. Immediately dropped my bags, reached the tip of the rock and stretched my hands to feel the chilling breeze in the clouds. Found a place to relax and rested down flat facing the sky watching the clouds passing by the moon. As it was a cloudy did not see stars in the sky. Later we started to have our dinner in moon light and finished with in few minutes. Best part was yet to come. We dispersed in all directions with our torches to grab some wood for camp fire. After exploring all we could grab enough wood which would last long. We made a circle around the camp fire and started to discuss regarding many topics and jokes. The major topics were Rahul Gandhi, Kejriwal, marriage vs love, trekking and passion. At around 4 AM one by one started to get into their sleeping bags. Then we all decided to take a nap at 0430 AM and set our alarms for 0530 AM so that we can notice the beautiful sun rise. The wind was very chilling and could also hear her roars. Within in no time the alarms started to ring and team woke up. To our surprise the clouds were very thick that we were not able to notice the sun rise. Without waiting any more we packed our bags and started descend journey. On the way down we came across 2 children between age group of 4-7 years climbing the hill bare foot to offer their prayers to the Goddess Durga. I felt different for that however took that as a motivation factor and continued the path. On the way down were able to grab few photo shots as we were ahead the schedule. We reached 8 AM to foot of the hills and took rest for 30 mins and started towards the village Sathnuru in an auto rickshaw. Had our breakfast with the local people over there in their local hotel. The idly, dosa and poori were part of our plates. During the breakfast we were sharing our experiences of the trek and what could have been done better. Later we got our bus and started back to Bangalore. Now everyone started to switch on their mobile, 3Gs and was sharing their experiences with friends and family. While all were busy with phones and I took a power nap in the bus and could wake up only to hear honking horns while we touched the city limits. We all started to disperse once reached their nearest points in Bangalore city with a promise in mind to meet again soon. Was an amazing experience during the entire trek as this was my 1st trek in the night. For me this was really different experience because it’s a bunch of like-minded people in one track.